The highly-anticipated Bellator 207 and Bellator 208 cards take place on Friday and Saturday night, respectively, featuring the semifinals of the Bellator heavyweight grand prix. The main event for Bellator 207 has light heavyweight champion Ryan Bader taking on Matt Mitrione, while Bellator 208 features Chael Sonnen battling Fedor Emelianenko. As of October 11, online sportsbook, 5Dimes has Bader as a sizable favorite. Bader comes in at -320, meaning you’d need to wager $320 to win $100 and Mitrione is a +260, meaning you’d need to bet $100 to win $260. The over/under on how many rounds the main event will go is set at going all three rounds with the fight going the distance coming in +155 and ending inside the distance is at -195. These odds are very surprising considering this is Bader’s (25-5) second career fight at heavyweight and first against a natural heavyweight. His 15-second knockout win in the opening round came over Muhammad Lawal, who is a light heavyweight that should be competing at middleweight, while Mitrione (13-5) has fought his entire career as a heavyweight. The only advantage Bader possesses is in the speed department. The lighter person is always going to be quicker. Mitrione hits like a truck with 11 of his 13 wins coming by knockout, including Fedor Emelianenko in June 2017. The key to victory for Bader is his wrestling. Even though the two-time All-American wrestler has won four of his last five via the KO/TKO variety, getting into a firefight with someone as heavy-handed as Mitrione is a grave mistake. Mitrione can be taken down. Look at his first-round win against Roy Nelson. After lighting Nelson up like a Christmas tree on the feet, Nelson brought Mitrione down to the canvas and nearly won the fight. Constant pressure on the ground would wear the former NFL player down and Bader can capitalize on that. Mitrione absolutely has to keep the fight standing. He has power in both hands and if he can clip Bader, the 40-year-old will punch his ticket to the finals. When a fighter is still active in a weight class and moves up to take a fight against the heavier person, more often than not, it equals disaster. Look at what happened at Bellator 206 two weeks ago when Gegard Mousasi made quick work of Rory MacDonald and this will be no different. As of October 11, online sportsbook, 5Dimes has Emelianenko as a sizable favorite. Emelianenko comes in at -250, meaning you’d need to wager $250 to win $100 and Sonnen is a +210, meaning you’d need to bet $100 to win $210. The over/under on how many rounds the main event will go is set at going all three rounds with the going the distance coming in +180 and ending inside the distance is at -260. This should be a cakewalk for Emelianenko (37-5, 1 no contest). Looking their respective skill sets, the former PRIDE heavyweight kingpin simply has more ways to win. He’s got unbelievable power in both hands, but his ground game is rarely talked about considering that he’s known for his spectacular knockouts. “The Last Emperor” has 17 career wins by submission compared to only 11 via KO/TKO. And Sonnen has been submitted nine times in his career. Sonnen’s (31-15-1) best path to advancing to the finals is his wrestling, as he’s a former All-American from the University of Oregon. He raised eyebrows in the first round against Quinton “Rampage” Jackson by staying on his feet longer than expected and doing moderately well before utilizing his ground attack to victory. Standing with Emelianenko is asking for trouble and Sonnen will do everything he can to get the fight to the canvas. Like Bader, this is Sonnen’s second career bout at heavyweight after fighting mostly at middleweight and a few outings at light heavyweight. 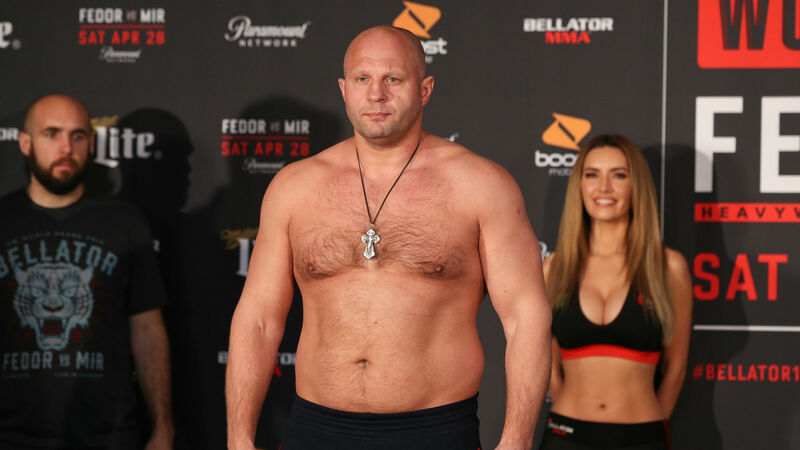 Emelianenko should win this going away, but at 42 years of age, a fighter can easily get old overnight and Sonnen’s ground game is good enough to keep himself out of trouble and wear down the all-time great. If you have some extra cash, pluck down on the favorite and make some easy money to take your significant other out for a meal.